Musical scholars have attributed its origins to Romany, Persian, Arabic, Jewish Mozarabic, and West African forms, even to South America for the music of ida y vuelta. What is the truth? Is it the stereotype, the cante jondo, or some hybrid that resists scholarly analysis? I do not pretend to know. I can only write about what I have experienced. Flamenco has three elements: the song (cante), the guitar (toque), and the dance (baile). The cante jondo is the most raw form. I have heard it in a toblao (flamenco club) in Ronda. (The peña flamenco is also a flamenco club, but usually with a regular roster of performers and regularly scheduled performances, open to the public.) The invited singers, guitarists, and dancers performed. Then a club member was invited onto the stage and everyone stilled. The guitarist gave him a few bars, and then he sang a cappella. Mournful, intense, dragged from the depths of his grief, the song poured out his heartbreaking loss and loneliness. I got it, the way I got blues singers in the American South. The cante jondo was celebrated by Manuel de Falla and Federico Garcia-Lorca, who organised the Concurso de Cante Jondo in 1922 in Granada. Some performers both sing and play the guitar. 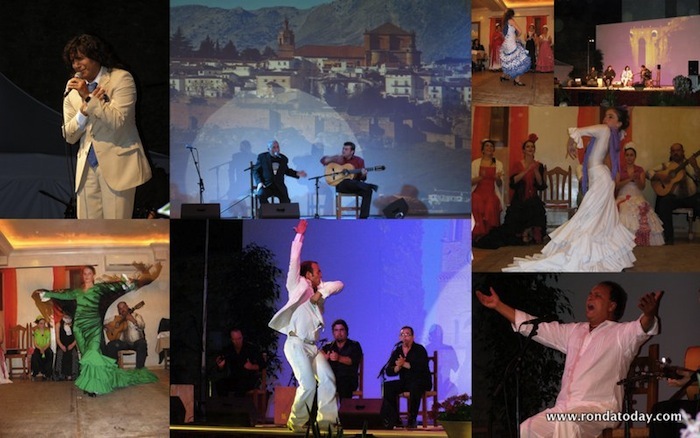 Aniya la Gitana, a famous Gypsy from the Ronda area, did this and singers like Vicente Amigo continue in this tradition. In his book, Duende, guitarist Jason Webster described his pursuit of the authentic soul and spirit of flamenco in this tradition. What he describes is one man’s road, certainly not the only one. Sometimes a man or a woman, or even a group, will be accompanied by a guitarist, maybe multiple guitarists, people clapping the rhythm or rapping on a table, and sometimes even a bass or other instruments. There are still singers who play the guitar and compose their own music performing in Ronda, including Cecilia Morales. Usually, their songs are lighter than the cante jondo, still about love, sometimes about loss, but nothing quite as deeply despairing. These “intermediate” flamenco songs are not as light as the cante chico, which are light-hearted songs about anything from making a salad and going by train to neighbours courting and being silly. They are still flamenco. Sevillanas, which has folkloric elements and is danced at parties, fairs, and festivals. Some say that it is not technically flamenco, but every flamenco dancer knows it and it is taught in flamenco schools. It is the hallmark of the April fería in Sevilla. It is danced in pairs, by a man and a woman or by two women. The spectacle of dozens of such pairs dancing is an amazing sight. The traditional female costume is a dress that fits tightly through the bodice and torso, then flares out in ruffled tiers, worn with heeled dance shoes that are studded on the soles to accentuate the sound. An embroidered and fringed shawl, usually pinned in place, is worn over the shoulders; a small peineda [decorative comb] and a flower or two in the hair complete the costume. The traditional male costume is a short jacket over high-waisted trousers, usually black or dark gray, with a white shirt and a scarf or tie at the neck. Bulerías is the iconic twelve-beat flamenco dance rhythm, kept by palmas (hand clapping) in six-beat groupings to produce a twelve-beat compas. I have seen the bulerías danced by groups of women and girls in swirling skirts, whirling and stamping at seemingly impossible speed, with their arms extending and curving as they gesture, I have also seen film of the bulerías danced by a couple. Much as I prefer live performance, I know that isn’t possible for everyone. If you enter “bulerias” on YouTube, there’s a variety of clips available, even some grainy clips of flamenco legend Carmen Amaya singing and dancing. There is also “soleá por bulerías” that has become popular in recent years. Seguiriya (sometimes the seguidilla as it is transliterated into French and thus known from the opera Carmen) is another 12-beat dance rhythm, characterised by the similar footwork and costumes to the bulerías, but usually danced by a soloist or a couple. It’s fast and very complicated, as if the dancer is spinning agony into substance through movement and music, a form of torture as it is drawn forth. Antonio Gades, a flamenco legend of the 1970s and 1980s, notably danced the Seguiriya. Gades and his frequent partner Christina Hoyos did some wonderful flamenco films: Carmen, La Boda de Sangre, and El Amor Brujo. In the Seguiriya, the sung line differs from the line of the guitar, producing a strange and unique fusion. Again, it’s not the same as a live performance, but you can find clips on YouTube. Bolero does not have its origins in Romany or folkloric tradition, but it has been adopted and adapted by flamenco, very successfully in my view. It is often danced by a group of women, sometimes by a mixed group, and often to the music of Ravel, although his composition is not the only one to use this rhythm. When danced by a man and a woman, the bolero becomes a dance of seduction and passionate power, and in flamenco, the partners usually do not touch (unlike in some other styles of dance). 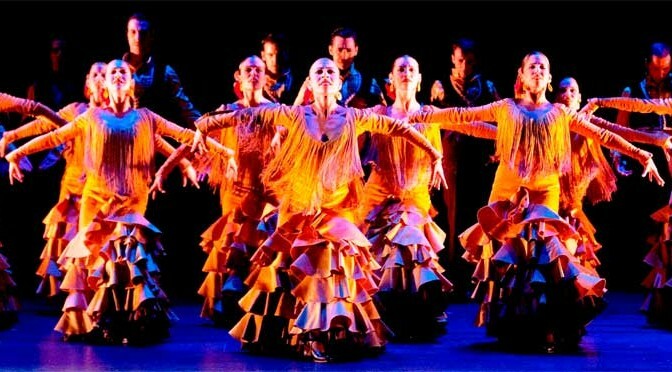 Fandango is also criticised by purists as not being “real” flamenco, but it is traditionally performed by flamenco dancers, usually older men. The experience that age brings is highly valued. This is a dance that requires immense stamina and fast footwork. Some dance troupes perform a version in groups, with the featured male dancer(s) surrounded by female dancers like a chorus. The male costume is typically the high-waisted dance trousers, a waistcoat or a short jacket, and a white shirt, although I have seen a man dance it in black jeans and a long-sleeved black shirt, open at the neck. In the 1950s, Jose Greco showed the United States how to dance the fandango on the Ed Sullivan Show and in films like Around the World in 80 Days. Suddenly everyone paid attention. He performed with Lola de Ronda in 1957 in New York . The dance institute he founded is now continued by his children. Tango comes from Cuba originally. The most famous tango is probably the Habañera from the opera Carmen, followed by the great tangos by Carlos Gardel of Argentina. While tango does not share the roots of other flamenco palos, it has been adopted and adapted for flamenco dance. As a ballroom dance, the tango is performed by a man and a woman, but in flamenco performances, it is sometimes danced by a female soloist and sometimes by a group of women, who may employ shawls and fans. Antonio Gades choreographed flamenco tangos for his films. Farruca is another later development, classified as cante chico, although it is hardly ever sung and when it is, the lyrics are as despairing as those of the cante jondo. Traditionally danced by men only, it is a demanding dance of rapid and precise footwork, stamping turns, held pauses, and sudden outbursts — profoundly expressive. Today, some women like Sara Baras dance the farruca. Men’s costumes are changing, too, with some men cleaving to traditional styles, while dancers like Joaquin Cortes often dance bare-chested or in pale colours. There are more forms than I have listed here, but it is likely you will encounter these in a performance or in film. It is worth attending the Concurso de Flamenco named for Aniya la Gitana, held in Ronda every year, usually in August, just before the goyescas. It will give you a live view of flamenco as it is practised today, a vibrant and thriving art form that grew from its roots here in Andalucía.